I have seen so much asparagus in the stores lately. I guess it is spring somewhere! If you can't find asparagus, haricot verts (skinny green beans) work very well in this unusual way to steam vegetables. I not only drizzle oil on the bag, but rub it in. Preheat the oven to 350 degrees F and arrange an oven rack in the middle of the oven. 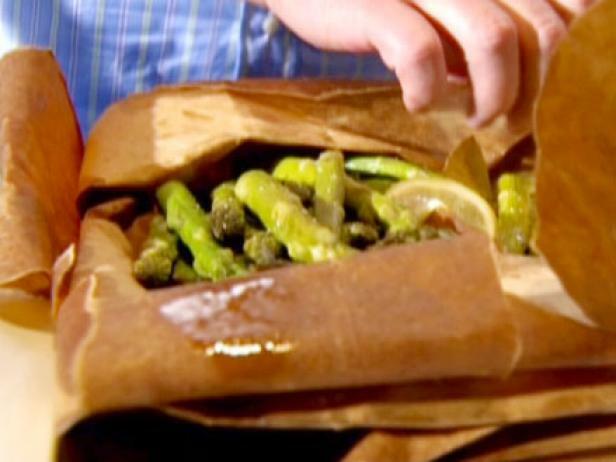 Get yourself a paper bag large enough to hold the asparagus comfortably. Rinse and don't drain the asparagus, adding to the bag while wet. Drizzle, then rub the outside of the bag with olive oil to keep the bag from burning. Sprinkle the asparagus with the salt and cracked pepper and toss in the lemon slices and bay leaf. Close the bag, folding it over several times and creasing the folds well to hold the steam in. Put the pan on a baking sheet, drizzle it with more olive oil, stick it in the oven, and bake for 20 minutes.